The predicted gusts to 20 Kts were realized this morning. Glad we had Simon's 32' to slice the considerable seas in the AM. We started at the targets and quickly limited out. Most fish were suspended in small pods. We stayed away from the trollers but one charter boat started bearing down on us as we were drifting. I asked Simon if he thought the captain saw us. Simon gave several blasts on the horn which is pretty loud. The boat kept plowing towards our port side. Simon started both engines just in time and applied all 500 ponies to avoid what would have been a certain collision. There was no one at the helm of the charter boat at all. We asked the captain if he was crazy and all he could do was throw up his arms. He then rapidly moved out of the area and headed for the Patuxent. I guess the moral of the story is that not all professional captains are competent all the time. This one was grossly negligent today. 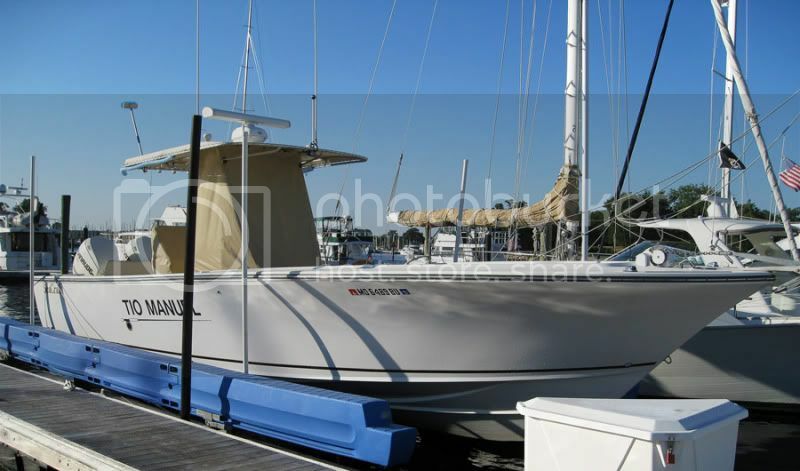 The captain's website claims over 25 years experience. Anyone can make a mistake but this one could have killed someone. Enough of that--back to fishing. 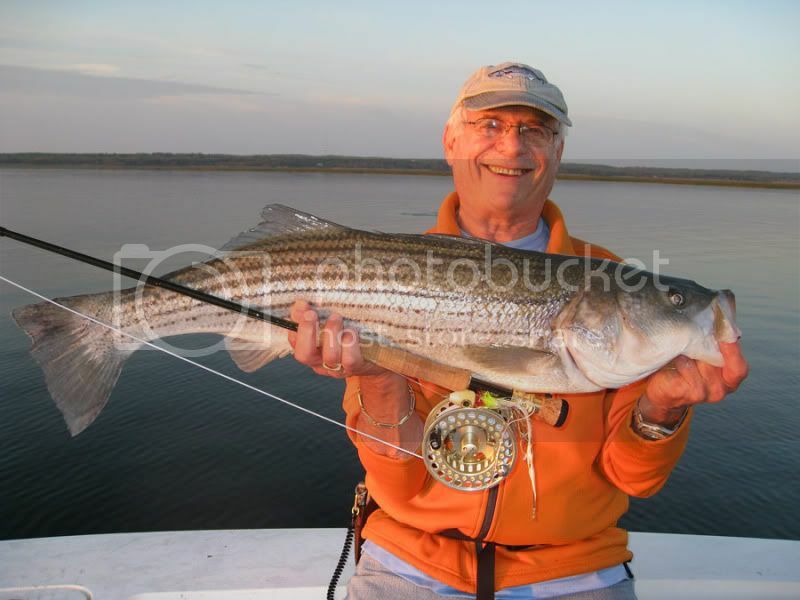 We did not get around to taking pics of Simon's fish today (he caught some nice ones), so I will include a pic of a fly caught striper from our trip to Cape Cod last week. We headed north and found small pods of fish in 38' to 42' of water over several miles. We saw no birds at all working today. This was a day of staring at the FF all day. Very few fish were on the bottom. Most were just above or below a thermo cline. Fish were caught on white bucktails, green BKDs and green or white sassy shad. Action remained steady from 7 AM until 3 PM. The ebb tide lasted longer than usual with the strong NE wind. The flood tide was a weak one and the fishing slowed. Here is one that grabbed a green sassy worked slowly. It was a gorgeous day on the bay and the fish fed aggressively. Hope to fish Mon, Tues and Wed next week. Last edited by Wild Bill; 06-04-2011 at 12:26 AM. Nice report Bill. Sorry to hear you guys had a close call. btw....sweet ride Simon has there. 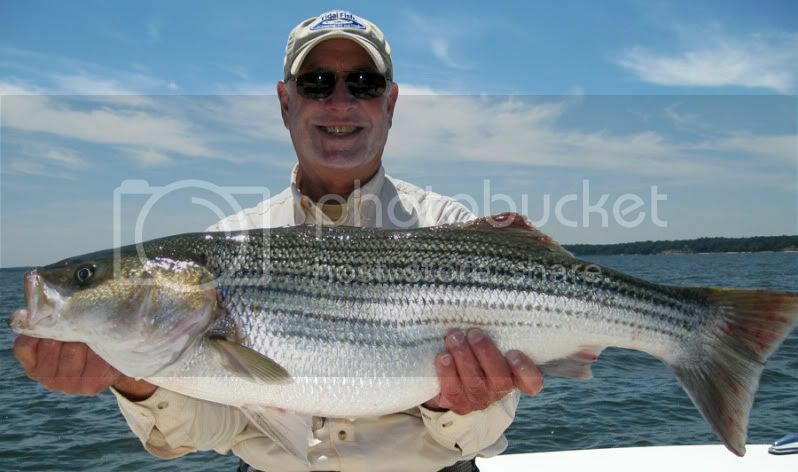 Now Booking light tackle Stripers!!! Good stuff!!! Sounds like your plan came together and you found some nice fish! Glad you guys avoided that close call, sounds like "some" captain needs to pay a little better attention. That could have resulted in one serious accident. Glad you guys were paying attention and Simon fired up those 500 horses to get you out of the way. I think most have had close calls on the water - points out how important it is to keep a sharp eye out and never assume the other boat sees you. More and more boats now have auto pilots - these are great but can lead to close calls. The strong north / north east breeze combined with out going current might have carried the boat faster then the captain realized. Sounds like they had a fish on - bet he mis judged the speed he was approaching you at. Still could have called you on VHF and said - Oops or Sorry. I came within about 200 feet of the only other boat near us on Friday. I was in cockpit and assumed the two guys in the helm area were watching for boats , crab pots , etc. Other boat approached from port - even though by law I had right of way - still called him on VHF to apologize. No big deal at all. I often say it in a joking way - but a lot of truth to it. If there are only two boats out there , damn if they will not hit each other. Seen it 60 miles off shore and in the bay as well. No one else around but the other boat and you end up on a collision course. Look at history of wrecks - many times two ships collide out in the middle of no where. Hopefully the captain will realize the close call and be more careful in future. Some charters seem to like to troll - IMHO - too close to other boats. I've been on some that came withing 20 feet of other boats that were hooked up. [QUOTE=27 sailfish;1731078]I think most have had close calls on the water - points out how important it is to keep a sharp eye out and never assume the other boat sees you.